I thought I’d use this to help give you an idea of what I’m currently working on the site. Due to work/family commitments Aussie Bushwalking improvements tend to come sporadically so I appreciate everybody’s patience. I also really appreciate everybody’s feedback and most of my work is guided by it. In particularly the UserVoice site: https://abw.uservoice.com/forums/122631-general and increasingly this forum. So… currently I’m working on fixing the broken maps. The site became too popular so I stopped getting free maps from Bing Maps. I’m in the process of moving everything over to use MapBox (https://www.mapbox.com/). One of the bonuses of MapBox is they use OpenStreetMap as a data source and it often has bushwalking tracks in the data so we get those on the maps. Eventually I’ll be displaying user uploaded tracks on the maps too. I’ve started the first step of that so keep uploading your GPX and KML files on the walks. Anyway, the map upgrade is getting close to done. I think I just have the popup maps on each walk left to do now so hopefully it’ll be on to new things soon. All the maps should now be up to date so time to look for the next feature to add. I’ve got a few bug reports to follow up on first. Hi Richard, it seems the large map on the ‘walks’ page is no longer working properly. The map initialialy load ok, but when I pan or zoom it eventually becomes unresponsive and/or no longer renders the whole map. It seems to do the same in all browsers. I have attached a couple of screenshots - one of the map, and one of firebug. Thanks Dave. I’ve been off camping so I’ll get stuck into it now. Thanks for the error trace - tells me exactly where I stuffed up! Should have it fixed this morning. I’ve just released an update to the map layer control (the drop down box that let’s you filter which walks you want to see on the map). Basically all the radio buttons are now checkboxes so you can select multiple difficulties at the same time instead of just all or one. Your selections should be remembered when you come back to the map as well. You can see these feature requests on UserVoice (https://abw.uservoice.com/forums/122631-general) and some discussion of the walk UI on this forum (https://talk.aussiebushwalking.com/t/do-you-edit-the-walks-you-do/37/5). I’ve got a preliminary version of the new page editing interface ready and would like some feedback. If you’re interested in helping out could you please contact me via email (richard@aussiebushwalking.com)? This is particularly handy on your phone as it’ll keep tracking you as you move. 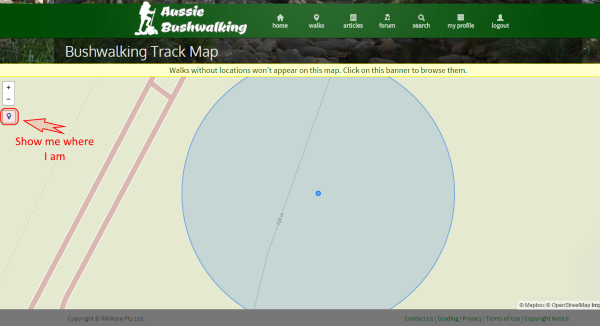 I used it yesterday during my afternoon bushwalk and it was fantastic - helped me confirm that the “track” that openstreetmap had wasn’t really there! This will be even more useful in future when I start showing the gps tracks that people have uploaded to Aussie Bushwalking. Thanks Dave. I’ve got an update for the add walk page almost ready to go so I’ll try to get that out ASAP. Hopefully I can sneak a bit of time this weekend. I’ve reworked the map as part of that so it’ll definitely fix this bug. 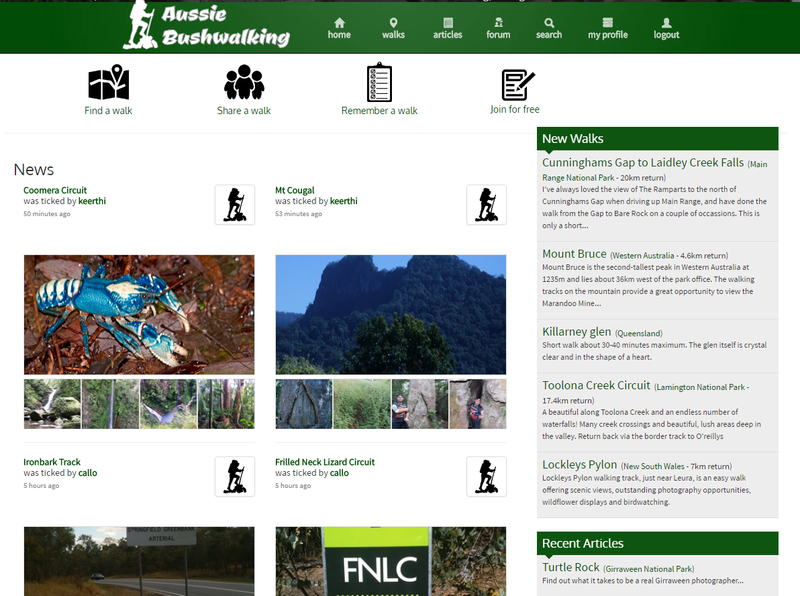 I’ve just released the new Add/Edit walk pages. It splits the process up into a few steps which means I’m now more comfortable adding to those steps. In particular I plan to add some “tags” to the walks next. This should also fix the map issue that Dave mentioned above. Great site Richard. Can I suggest adding a elevation gain fields (net and cumulative) underneath the route distance and time? It has a big bearing on the difficulty of a hike and I think it’d be great for users to update these based on their track logs. Thanks Dave for those plugins. Will hopefully get some elevation profiles up soon but planning on doing them on the server so they can be embedded straight in the walk pages. I’m almost ready to launch the tags feature. If you want to help with some testing then contact me via email (or go to the normal test site if you’ve helped in the past - I’d prefer not to link directly to it here). Tags can be set on or off or left unspecified thanks to a suggestion by Rob over on the UserVoice site. 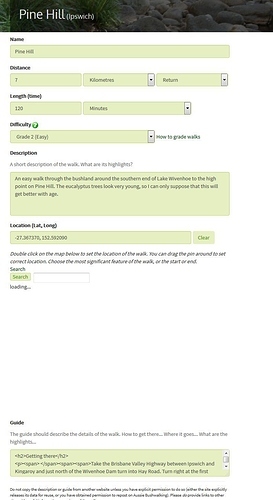 Unfortunately the initial launch won’t include some features like searching by tags but I figure it’s best to get it out there so everybody can start tagging the walks. Some updates to the homepage have just been released. Makes the recent activity list look a bit nicer. This is a follow up to the tags release which I quietly did a couple of weeks back. Hopefully you’ve seen some tags appearing on some of the walks. This update is part of the process of having those tags appear in other places. Another little update today which should provide a huge performance boost when viewing walks. My quick checks have the walk pages and the front page loading almost instantly which I’m mighty happy about! This is all due to some heavy caching so please let me know if you see anything out of whack (e.g. old data appearing after you make changes).